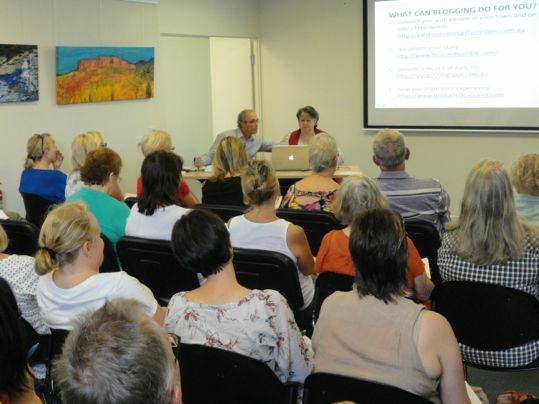 Our blogging workshop at the Maroochydore Library. I've been very fortunate lately to have been involved in writing and blogging workshops in the Sunshine Coast libraries. We do the last one today. My business partner and friend, Ernie Marcum and I, delivered the 16 workshops at every one of the council libraries. It was exhausting, we had to leave home far too early and too often, we carried heavy bags containing computers and notes, some days were hot, some days it rained, but we loved every minute of it. Not only did we get to talk about things we love doing, we met some incredible people who are passionate about writing and blogging. We also met hard working librarians who focused on delivering appropriate and interesting activities, workshops and reading materials for their communities. 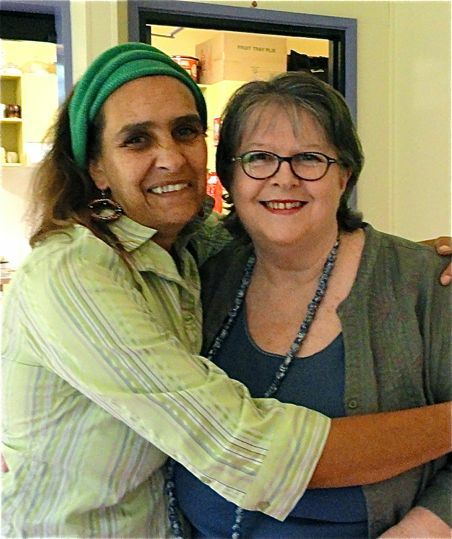 This is me with my good friend Beverly Hand, elder of the Kabi Kabi people. We met at our Neighbourhood Centre and I'm sure we'll be lifelong friends. Above and below are community events that rarely rate a mention in mainstream media yet they're an important part of our community. You need to be part of your community to know when your local events take place. I have no doubt that libraries need more funding. They're doing a great service with what they have, but we need more librarians, and the libraries need to be open longer hours and open up to even more new programs and ways of operating. If you're in Australia, I urge you to lobby your local councillor to increase library funding and employ more librarians. Just a quick email should do it. Libraries are wonderful places. They are there for us in large and small towns and in recent years they've been moving from the older model based solely on books and reading, to a wider approach of presenting workshops, genealogy research and resources, JPs services, baby and toddler reading and rhyming and much more. Libraries are the community places that many of us feel comfortable in. We introduce our children to them at a very young age in the hope of developing a lifelong love of reading and learning. 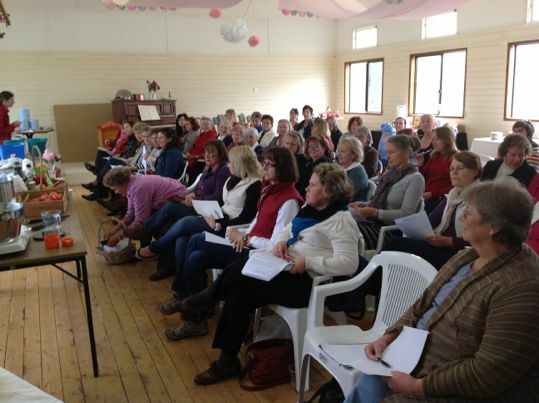 This community gathering was at Bell last year when Hanno and I travelled out there to demonstrate how to make soap, scones and laundry liquid. We had the best time with these ladies and Hanno was spoilt with hot coffee and cake - frequently. Often in the past, when we moved to a new community, the library was my first port of call because of the local information and valuable connections to be made there. For all of us who live a simple life, libraries hold information we need, spaces we can use for community meetings and ideas for future projects. But I love libraries because of the people there. If you've simplified, cut back or downsized, then probably, like me, you won't be interested in most of the mainstream advertised information about big TVs, mobile phones and $400 shoes. You'll be looking for information that is not broadcast. You want to know where to buy old breed chooks, the best value for money water pumps and solar panels, organic yarn, good knitting needles and crochet hooks, incubators, honey extractors, where the community gardens are and the closest farmers' market or LETS market. You'll never find this sort of information in a magazine and often not even in the local newspaper. You need to know people in your community who will tell you. You need to build your community networks. 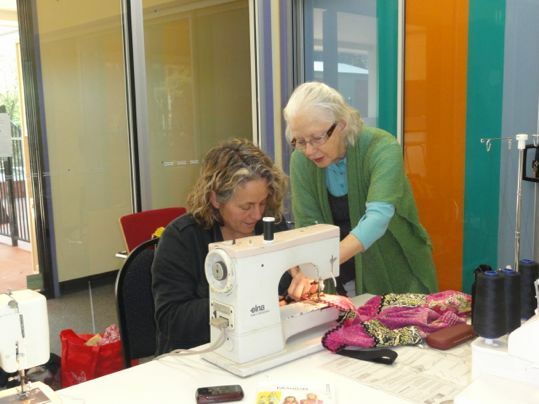 In our community, you can learn to sew at the Neighbourhood Centre, and it's free. Community networking can start, very successfully, at your local library. If they don't have the information you're looking for, ask the librarian or put up a notice on the noticeboard. Ask about community groups you can join, be active, get out and be part of your community. Your neighbourhood will only be as supportive and active as you make it. If you're living a simple life, if you're aiming for a sustainable lifestyle, it will open new doors for you if you get out and be a part of your community. I have found you only ever get out what you put into life and when I first ventured into my community about ten years ago, a whole new world opened up for me. I have been changed in profound and significant ways simply by being part of my community. If you haven't made your connections yet, don't wait to be asked, every community is screaming out for people who don't mind a bit of hard work. Just dive in, get involved and be a part of something special. If you're a part of your community I'd love to know how you got involved in the first place. As a Librarian,, I would like to second your comments that libraries are great community resources and we need more and more Librarians. Over the past few years my experience is that staff are asked to provide more new services/activities while staffing levels have dropped. People should lobby their Member for State Parliament as well as Council as funding for Libraries comes from both. I'm big on community groups, we had a discussion at our bible study last week about what makes a community a good community. Some of the things were groups and services. We also discussed the physical layout as in having communal places where people meet like parks and CBD shopping areas. We also said a group of different people of different ages and different skills, it wouldn't be great if everyone in the community know how to wire a house but no one knew how to build one or garden or paint... We also talked about safety being important to creating a good community! I know that you are just starting your day in Australia, but it's almost dinner-time on the 27th here near Washington DC. I get to have a rare treat today - it's my birthday, so I get a chance to read your blog while the kids play something on the TV and my husband makes "birthday cookies" for me! And your post is about my favorite place in the whole world - the library! I do need to get out and get into my community more, but the library has been a big part of my life ever since I was small. My mom would walk my sister and me into town with the wagon for their summer program once a week, and the love of reading has been passed on to all three of my kids. It's so refreshing to go somewhere and know that we are going to be sitting there for at least an hour, looking for books and reading at the little tables. Thank you for such a great post on "my day"! Just looking at the sewing machine in the picture at the neighbourhood centre and looks very similar to mine. I bought mine in 1976 and it was called an Elna 'Special' and it is still going strong. It did have an overhaul a few years ago and has had a new foot fitted. I really must try harder to find a like minded community though I think it is a bit more difficult when you live in the major cities and everyone is just so busy. We currently live in Sydney where being involved in the community can be challenging, but we did it by volunteering at the local community services organisation. That was a good start. But we are moving to Bathurst in the next few weeks, and a big part of that move has been getting to know what options are available for getting involved, as I know that will be a big help to me in settling in the new life. Again, volunteering will be a big part of it, but simply getting out and about, connecting with people, talking to people, is essential. I don't want to feel isolated. I want to know the person I buy my milk from, and the local butcher, and the similar-minded people in town. I can't wait! I grew up in Bathurst and my mother still lives there. It's a lovely town, I hope you enjoy living there! Our nearest community hub is Laidley and I made it down there once in late December to visit the library, get a list of their programs...and then the latest flood hit. The library still hasn't opened for workshops and kids activities, although there is a mobile lending library we've been getting books from. We've also found a lot of the programs and kids activities around here are quite religion-based, which given we're not religious, sort of rules them out for us. I have met a few like-minded mums, perhaps I will organise some kids activities for us on my own. Love the post on Libraries and Librarians! A few months ago I retired after 46 years as a Librarian. I like to think I helped a lot of people connect to information and community during that time. It was a wonderful life and enjoyable work. Yes, the pay was poor but enough to live on! As long as libraries exist, people can never say they don't have enough money for books , dvds, toys etc. - it is all there and so much more.Plus the staff are just so caring and understanding...my children's favourite day when they were small was library day and now they are teenagers that excited look still comes over their face when I suggest the library as a school holiday activity. I agree with everything you've said here Rhonda. I love our library! 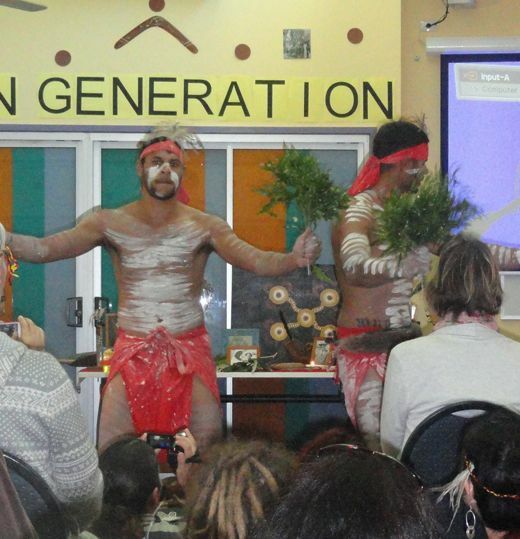 We have a brand spanking new one that the community fought long and hard to fund and the land was made available by our local Aboriginal land owners - for the community. Just tonight I have come home from an exhibition held in our now "old" library. The pop-up exhibition and shop will support local creatives - painters, crafters, musicians etc and the whole thing was backed by our local council. I am sure many more community events will be held in both the new and old libraries.. They are the hub of town life and yes, wholeheartedly agree with you that we need to support them and keep them going. They are needed more than ever! So good to hear of your blogging workshops. I would dearly like to share my skills in the same way for our local community. You're schedule sounds a bit gruelling, but what a wonderful thing to have done. Our local library has a kid's craft table at the moment with all sorts of recycled scraps and boxes and rolls etc for kid's to create collages and other crafts. It's a great service! Another place I have found useful for growing community is, ironically, Facebook. 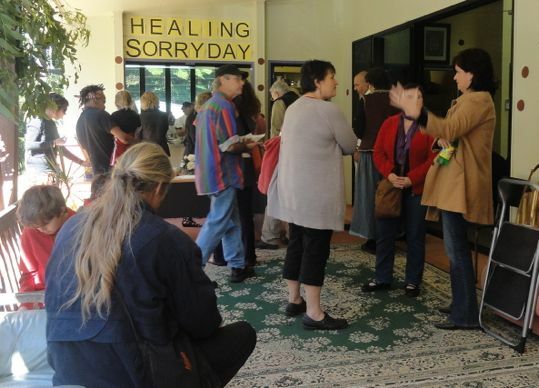 The Sunny Coast has a barter page, there are also community pages where people organise meet-ups to get to know others living on the coast. There is also a book page for people to discuss books and swap / lend / sell books. I'm sure there are similar community pages for all regions. My family loves the library as well. My kids probably can't remember a time when they *haven't* gone to the library! I am another one who has found community online. We homeschool, and ten years ago I started a local online homeschool community. This, of course, led to park days and field trips and lots of new friendships. I have "liked" many of our community Facebook pages, which keeps me up-to-date on what is going on around town--and has given me an opportunity to win several prizes in give-aways, as an added bonus! One of the prizes was a walking tour of our downtown's history. I have also won books from the library, tickets to events, a dvd of historical photos from our area . . . lots of great things to connect us with our community and history. Another community hub for us is, ironically enough, the local mall. I don't think they are doing very well from a retail standpoint (more and more empty storefronts every month), but they put on a lot of community events like free concerts in the summer. They even let groups use the empty retail spaces as meeting space (we had a homeschool Lego club there for several years). When my husband deployed, they let us set up a Yellow Ribbon Tree where people could write messages of support for the troops. They also provide a cooling center when the weather gets too hot, for those who may not have access to air conditioning. I find that my family goes to the mall much more often for community events than we do to shop. This was a great post . . . it seems that fewer people value community these days, which leads to a lot of apathy. Twenty years ago when we left our hometown and moved 500 miles away I made it a point to go to the library and get our cards and check out some materials. It just seemed the most familiar thing we could do in a place where we knew only a realtor.